Three DFB fire engines responded to the blaze from North Strand and Phibsboro fire stations. A MAN HAS been rushed to hospital after being rescued from a building fire in Ballybough. 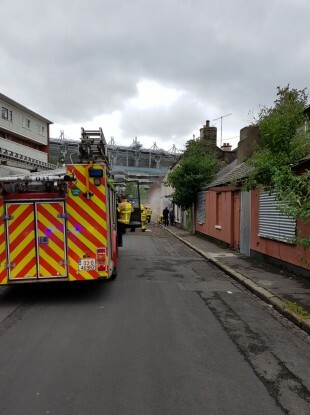 Dublin Fire Brigade units rescued the man from the blaze in a building on Sackville Avenue, just off the Ballybough Road on the outskirts of Dublin city centre. Three DFB fire engines responded to the blaze from North Strand and Phibsboro fire stations, as well as an ambulance. The man was taken to the hospital by ambulance with smoke inhalation. It was initially thought that there were two victims of the blaze, but when emergency services arrived they found just one man in need of medical assistance. The fire has since been brought under control by DFB units. Email “Man rushed to hospital after being rescued from building fire in Ballybough”. Feedback on “Man rushed to hospital after being rescued from building fire in Ballybough”.